Today’s TV viewers are presented with endless viewing options, all with different types of content. In order to find the most relevant content, viewers are expected to be proactive – and spend a significant amount of time searching for content that matches their interests. This is often referred to as “lean-forward” TV viewing. But sometimes viewers may want an easier and faster option to just sit back, be entertained and enjoy a lean-back viewing experience. On the other side of this equation are the broadcasters. Owning a portfolio of TV content, you sit on assets that can be mixed together to create new channels, or virtual TV channels rather, delivering a constant flow of programming relevant for certain demographics or viewers with a certain interest. Especially this could be valuable for live content – typically sports or music events – as a main attraction and add related VOD and live pieces, that complements the main, live programming. What if these two camps – the viewers wanting theme-based content for lean-back viewing and the broadcasters owning the relevant content – could be brought together using a technology that made this really easy to accomplish? Edgeware has a solution for this. 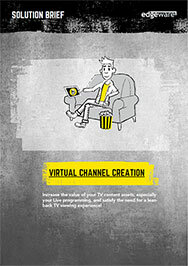 It’s called Virtual Channel Creation and comes with a set of benefits for you as a broadcaster. Download our solution brief the learn more!